Preheat the oven to 180°C/Gas Mark 4 and grease four small pudding tins. Add the dry ingredients to a mixing bowl and combine well, then pour in the contents of the saucepan and stir until just combined. Fill each of the pudding tins half way up with the mixture, then place 4-5 cubes of chocolate and a sprinkling of salt in the middle. Pour over the rest of the mixture, then give each tin a tap on the surface to level them out. Place on a baking tray, then into the oven for 12 minutes. 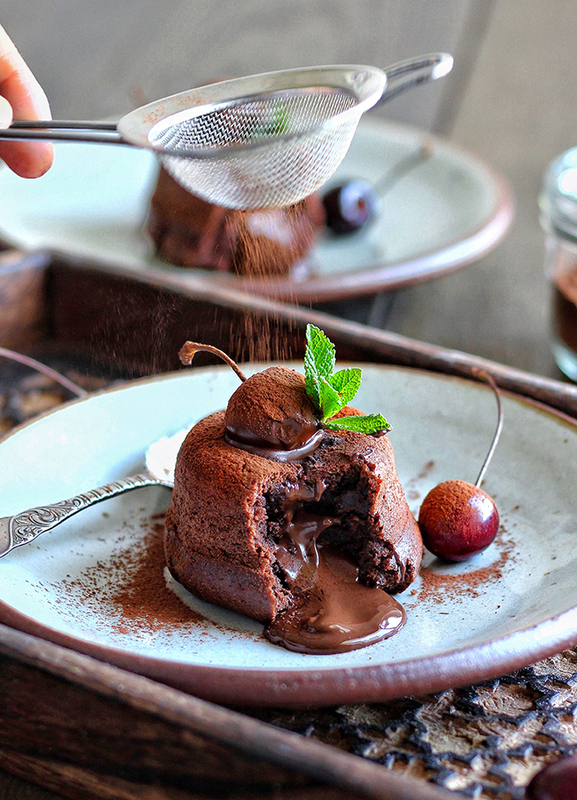 Serve fresh from the oven with cherries and a sprinkling of organic cocoa powder.